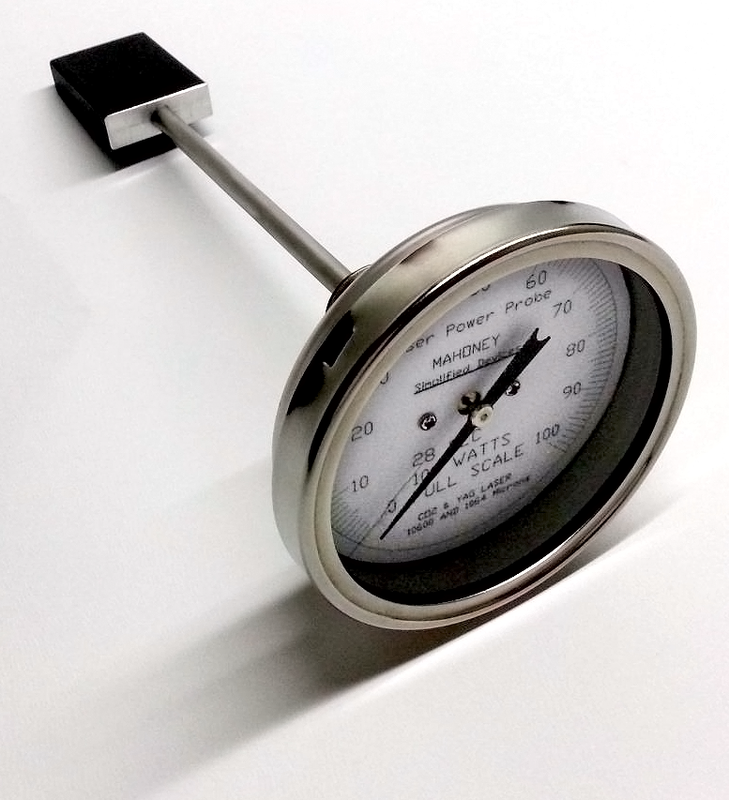 Mahoney brand CO2 YAG Laser Power Meter Probe for Laser Engraving and Cutting Machines - TOP SELLING PRODUCT ! Buy Now 100 watt probe with this link . Quickly diagnose laser output power problems. Determine if optics require replacement or laser tube needs a refill or replacement. A low cost tool that every laser machine owner needs. Less than $100 on some models. 100, 200, 500 watt are the most popular selections. 100 Watt CO2 Laser Power Measurement Probe. Comes with instructions and original packaging. Measures laser power for YAG (900-1250 nm) and CO2 (8-11 microns). Laser measurement range from 0 to 100 watts. This probe is TESTED and FULLY OPERATIONAL . Laser power measurements are quick and easy with the 100 watt power probe. Position the power meter in front of the laser beam and 28 seconds later read the power measurement. This power probe is a CALORIMETER TYPE power meter which measures laser power using a timed exposure. can be used with continuous or repetitively pulsed lasers . The 100 watt laser probe has a coating that works for the wavelength range of 0.2 to 11 microns. The absorbing probe head is conveniently sized . The head is large enough to be easily used, yet small enough to be inserted between optical components to measure the laser power without disturbing set-up. 28 SECONDS SETUP - It does not involve a time consuming setup and alignment like other power meters. Unfortunately, most laser power meters have sacrificed ease of use to gain continuous power readings. However, in most laboratory and production situations, the usual requirement is for a quick spot-check of power with a minimum of disruption. The 100 watt power probe is a self-contained unit consisting of an absorbing head, a temperature measuring mechanism, a zeroing screw/nut and a readout dial. In operation, the dial is zeroed. Then, the absorbing head on the end of the power probe is exposed to the laser beam for 28 seconds. After the laser probe is removed from the laser beam, the average power can be read out on the dial. If it is necessary to make several power measurements in succession, the absorbing head can be rapidly cooled by immersing into a bucket of water between measurements. Video On Youtube , search - watt co2 laser power measurement . See videos for several laser power probes. This product is great for owners of laser engraving machines, laser engraving systems, laser cutting machines, laser cutting systems . 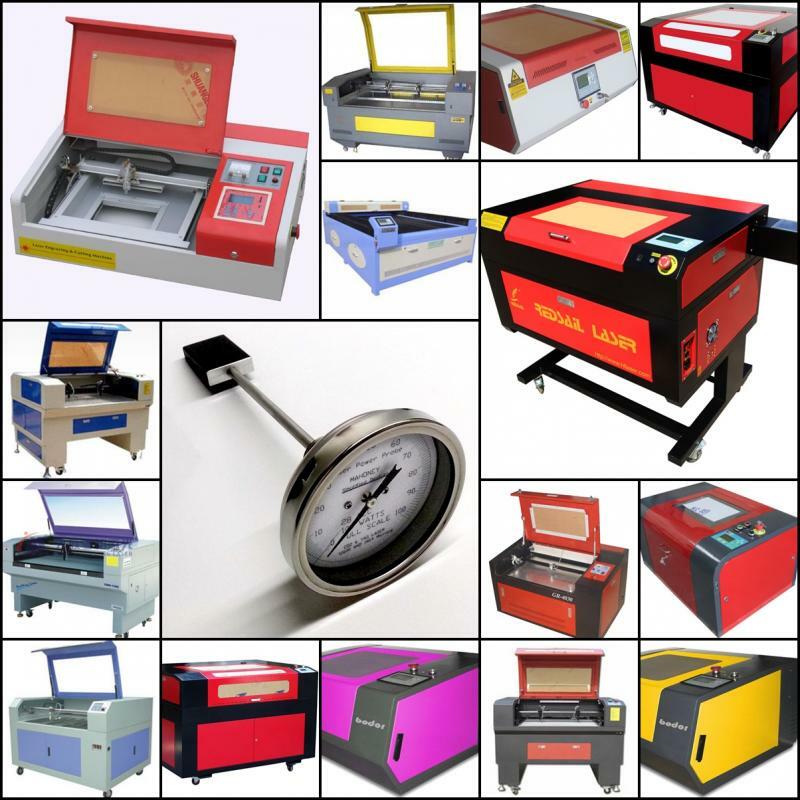 Also for owners of CO2 glass tube lasers, CO2 and YAG laser markers, laser marking machines, fiber laser marking machines . It even works with RF lasers manufactured by Synrad, Coherent, Rofin, Universal Laser, Epilog Laser, Universal Laser Systems, Gravograph, Pinnacle, RECI, EFR, Jilin Yong Li, Mactron Technology, North Star Electron, Shanghai Jinke Intelligent Technology, YL Lasers, Prima, Trumpf, PRC laser. It works with laser machines made by Rabbit Laser, GW Weike, Yueming, Hans Laser, Beijing New Power, Chutian, Foshan Beyond, Grand Bird, Jinan XYZ, Perfect laser, Suke , and many many more. Get your quick laser power output reading today and exercise your warranty as needed. 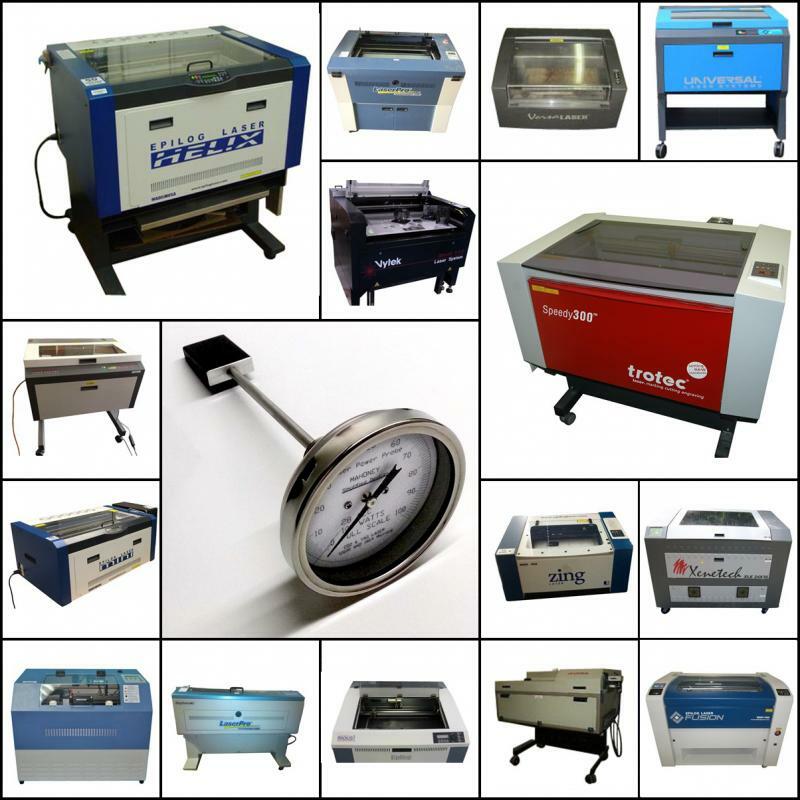 Ensure the best quality for the laser cutting and engraving now. Do not miss this opportunity for our introductory pricing. When to buy a laser power meter probe? Used medical lasers, CO2 lasers, check the power prior to purchase. Includes surgical CO2 lasers, veterinary surgical CO2 lasers, Luxar, Lumenis, Accuvet, Aesculight, light scapel, and other popular brand names. For warranty claims on laser tubes. Ensure that you get the laser power that you paid for. To check or verify against internal power meters on laser systems. Even though an internal power meter shows a reading, this power probe will show the true reading of the laser output power. "Perfect item, great price and very fast delivery.. very satisfied also the communication with seller was perfect!" "It's a great product and I didn't have a problem with shipping or anything at all"
"At this moment we still negotiating with the manufacturer about the warranty that is on the laser tube. [after using Mahoney power probe]﻿"
"I watched the video on youtube and wanted to test power before making the decision to upgrade my Epilog Laser." "I got different readings from the tube to the focus nozzle(with the focus lens removed). 60 watts at the tube and 45 watts at the first mirror 38 at mirror 2 and 30 at mirror 3. [Cleaning the] dirty mirrors brought the power up to about 55 watts at the nozzle"
"... my 120w has only 60w @ the table. All optics are clean and beam is aligned. The laser is still under warranty so Epilog should take care any issues.﻿"
Q: "... a new 50 watt machine @99% power gave a reading of 35 Watts China CO2 Laser. Are they usually over rated? and an older 40 watt machine gave reading of 15 watts. This machine was not consistent when cutting this reading may indicate problem.﻿"
A: 35 watts is too low for a new 50 watt tube. For China CO2 glass laser tube suppliers, typically the stated value is the maximum value (except for RECI). For example, an 80 watt tube brand new will put out 76 watts or 74 watts. But 35 watts is a significant chunk less than 50 watts. That is a 15 watt reduction, or 35/50*100% = 70% of the rated power. Much too low. I would suggest the following approach:1. Measure the laser output power prior to the first beam bending mirror (to ensure that the problem is not misalignment or a bad optic).2. Measure the diameter and length of your laser tube and check the measurements for the power level for that tube. Typically, the measurements can be found on eBay seller listings, so search co2 tube 50w to get the measurements. The purpose of this check is to determine whether you received a 50 watt tube or a 35/40 watt tube instead. 3. If it is 50 watts by the sizing, and 35 watts prior to the first mirror then contact the manufacturer for money back, or a replacement, etc. Different monitors for different models and laser powers. Inquire with your model. Prevent costly damage to the most expensive part of your Epilog Laser machine--the laser itself. Get early warning signals of degrading or bad parts and take action before it costs you a very expensive laser replacement. See live performance diagnostics of your laser while running each and every job by placing the small monitor in a visible location. Provides instant diagnostics on problems for damaged or older lasers that need repairs, simply plugging in then running the laser permits you to determine which components may need repair. 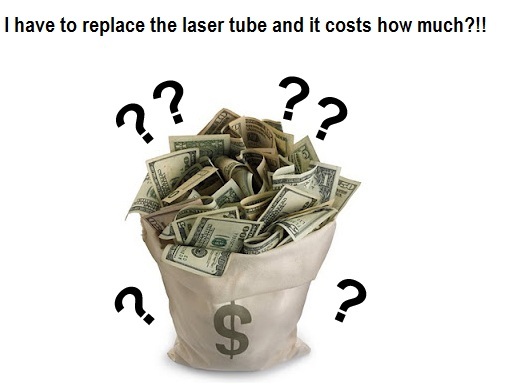 Saves hard earned cash by enabling laser component problem identification and specific repair, thus doing away with that standard line "You need a new laser" and breaks it down to what is the problem and how do we go about fixing it for a reasonable price. 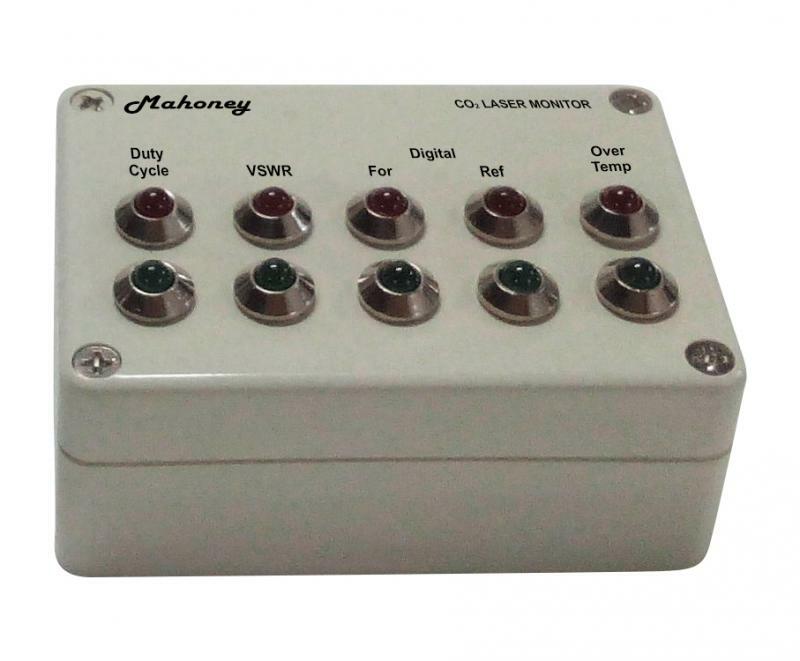 Buy Now Mahoney CO2 Laser Monitor with this link.